I finally did it. 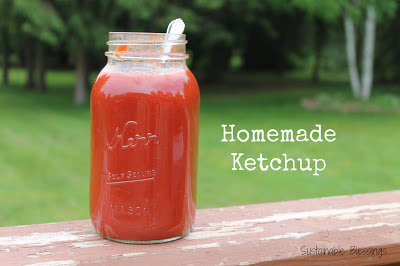 I've been meaning to make ketchup from the THRIVE Tomato Powder for months. I keep hearing about how good it is, and how easy to make, and now I know for myself. So good I have to share the recipe. Super-Duper Simple. In a medium sized pot combine all the ingredients. Stir with a wooden spoon to mix and bring to a boil, stirring frequently. Reduce heat and gently simmer, stirring frequently till ketchup reaches the perfect consistency for you. Expect that to be about 45 minutes - depending on thickness desired. Pour into glass jar and refrigerate. Mine yielded 2 pint jars. Best to let it sit for a day to allow flavours to fully blend (that's if you can stay out of it that long). That is it! How easy is that? Almost embarrassing its so easy. And economical too. And you know the best part? The ingredient list on the can of tomato powder is .... wait for it .... TOMATOES. That's it. Nothing more. So the only thing that is in my ketchup is what I put into it. From beginning to end - I was in control. I like that. One more way for me to control the goodness of the food I serve my family. And one less thing I need to go to the store for. I will never buy ketchup again.